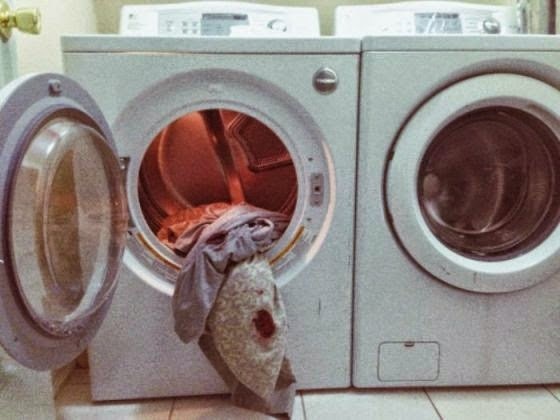 Rupi Kaur, a Sikh poet studying at the University of Waterloo, Canada, posted an image of her during her period as part of her photo-series project for a visual rhetoric course on Instagram. The photo shows Rupi in bed with a patch of menstrual blood which had stained the same sweatpants she's wearing above, and had also leaked on the bedsheet. "Thank you @instagram for providing me with the exact response my work was created to critique. You deleted a photo of a woman who is fully covered and menstruating stating that it goes against community guidelines when your guidelines outline that it is nothing but acceptable. The girl is fully clothed. The photo is mine. It is not attacking a certain group. Nor is it spam. And because it does not break those guidelines I will re-post it. I will not apologize for not feeding the ego and pride of a misogynist society that will have my body in an underwear but not be okay with a small leak when your pages are filled with countless photos/accounts where women (so many of whom are underage) are objectified, pornified, and treated less than human. Thank you. This image is a part of my photoseries project for my visual rhetoric course. you can view the full series at rupikaur.com. I bleed each month to help make humankind a possibility. My womb is home to the divine, a source of life for our species, whether i choose to create or not. But very few times is it seen that way. In older civilizations this blood was considered holy. In some it still is. But a majority of people, societies, and communities shun this natural process. Some are more comfortable with the pornification, the sexualization of women, the violence and degradation of women than this. They cannot be bothered to express their disgust about all that but will be angered and bothered by this. We menstruate and they see it as dirty, attention seeking, sick, a burden. As if this process is less natural than breathing. as if it is not a bridge between this universe and the last. As if this process is not love, labour, life. Selfless and strikingly beautiful." 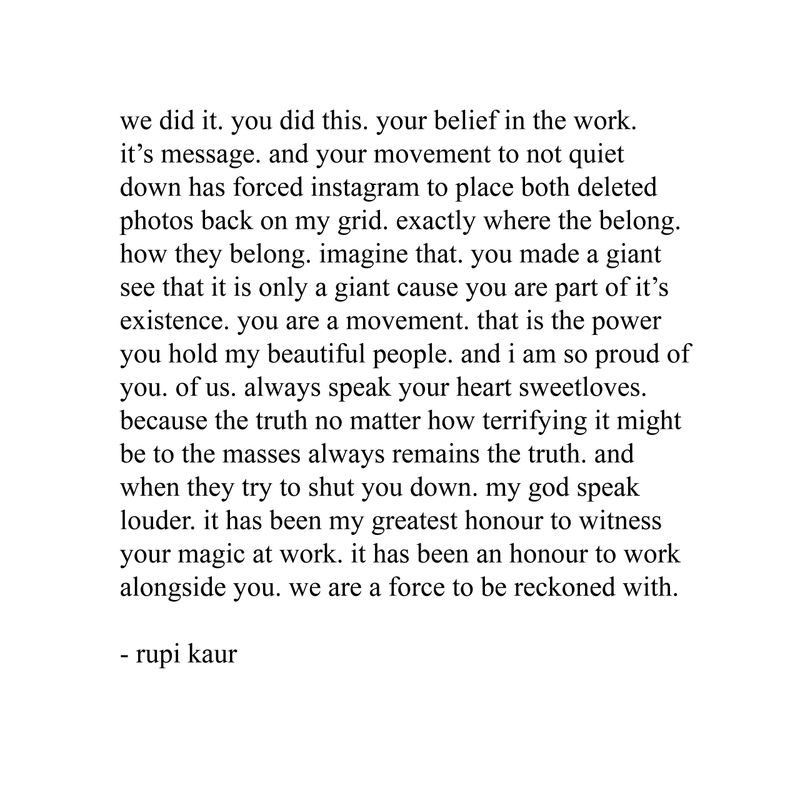 Instagram again removed the photo so Rupi moved her activism to Tumblr with more photos and asked people who support her to share. As someone who has heavy bleeds and used to stain the sheets even after I was married, I remember the shame I felt in the beginning. Luckily, I have a very open-minded and understanding husband. But a lot of men don't understand how periods work, putting so much pressure on woman to ALWAYS appear perfect. Instagram has chosen to once again, take down this image for violating community guidelines. Despite the fact that about 95% of comments were beautiful. And in support. This just goes to show who is sitting behind the desk. And who's controlling the show, who's controlling the media and who's censoring us. It’s sad that this is still happening in this world. I know that some communities and cultures go out of their way to shun and oppress a woman on her period. I guess Instagram is another one of them. Some women aren’t allowed in their religious place of worship or out of their homes to do certain things. And are told they are sick. As if the period is a common cold. 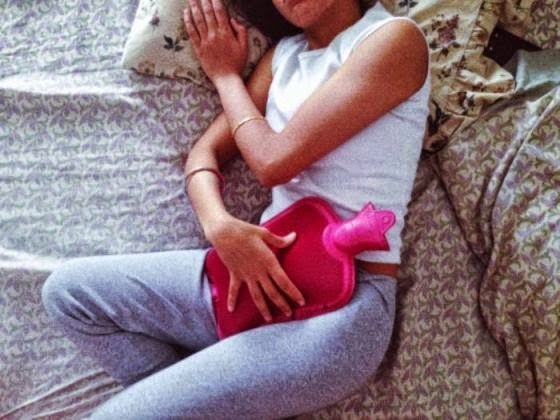 I have been hospitalized many times because of issues associated with my period. I have been suffering from a sickness related to my period. And ever since I have been working so hard to love it. Embrace it. Celebrate it. Even though it’s given me so much pain in the past few years. and they want to tell me I should be quiet about this. That all of this we experience collectively does not need to be seen. Just felt secretly behind closed doors. That’s why this is important. Because when I first got my period my mother was sad and worried. And they want to censor all that pain. Experience. Learning. No. I am going to share the photo again once I figure out how to go about it. I would appreciate if you could @instagram and express your thoughts. Or even share the photo on whatever social media platform. Their patriarchy is leaking. Their misogyny is leaking. We will not be censored." So how does this story end? 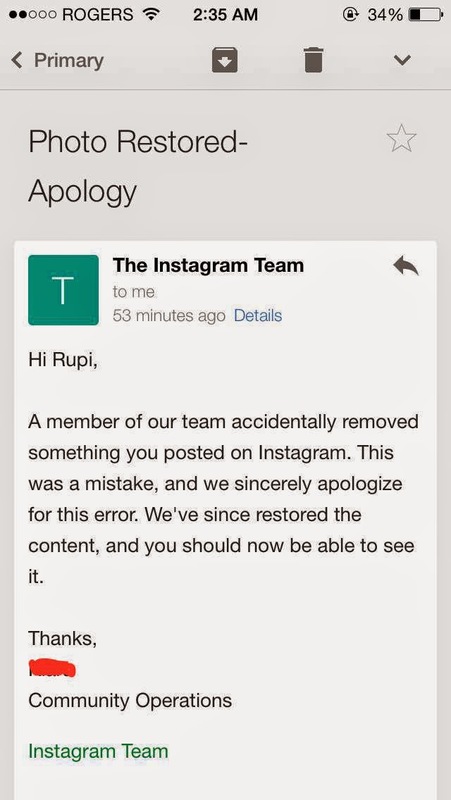 Well, Rupi's activism worked and the photo has been posted back by Instagram! More importantly, the young woman has started a conversation that might help a few women out there come out of their prison of silence on their periods. Kudos to her! Wow. very commendable, in a society where we misplace virtues and priorities. I have stained the sheets a few times since I met my fiance and he's not only understanding but helps tidy it up! I very well try to be 'perfect' by being cautious and adding extra padding - but it helps to know that I really am not expected to be perfect and nothing changes with the stain. Just the sheets! Kudos to Rupi; thanks Myne for sharing. While I'm not squeamish, I really don't get it, I don't get the activism. Do we now post pictures of poop and us pooping just because it's natural?